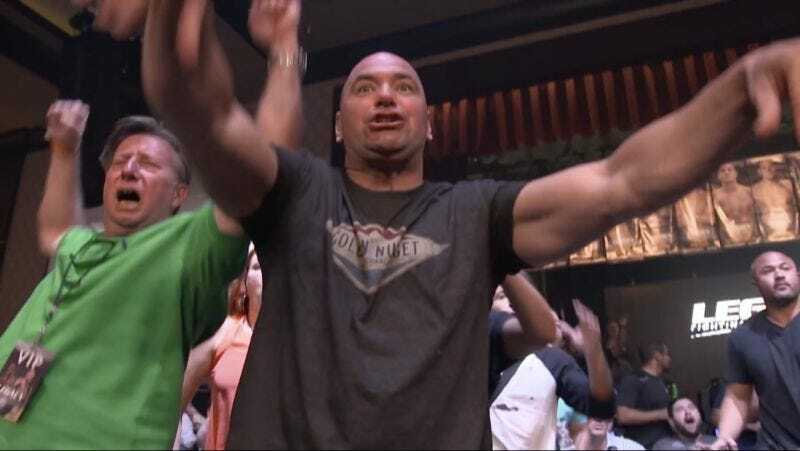 According to a report from ESPN’s post-human business lad Darren Rovell, the owners of the UFC are in “advanced negotiations” with at least four potential buyers regarding the sale of the promotion. The UFC is owned by (mainly) the Fertitta brothers and (also) Dana White and the government of Abu Dhabi, and if Rovell’s sources are correct, they stand to split up between $3.5 and $4 billion on the deal. At least four bidders — including WME/IMG, China Media Capital, The Blackstone Group and Dalian Wanda Group — are believed to have submitted bids for the organization. The winning bid, should things proceed, is expected to be for a valuation of in between $3.5 billion and $4 billion, multiple sources with knowledge of the negotiations told ESPN.com. The leader in the bid to buy the biggest mixed martial arts business in the world is said to be Chinese-based conglomerate Dalian Wanda Group, sources said. Its chairman Wang Jianlin is the richest man in China, worth nearly $35 billion, according to Forbes Magazine. The company has been slowly been getting into sports. Last year, Wanda bought a 20 percent stake in soccer superpower Atletico Madrid for a reported $48 million. In March, amidst the FIFA scandal, the company agreed to sign on as a FIFA partner, the highest level of sponsorship, through 2030. This is an interesting time for huge companies to want to get into the MMA business. The company made a shitload of money in the past year after Conor McGregor and Ronda Rousey emerged as legitimate superstars, but is also facing an antitrust lawsuit and a variety of questions related to the sustainability of its business model. Perhaps this massive valuation indicates that potential buyers feel confident that the UFC will emerge unscathed from all of this, and perhaps it indicates that some people have more money than sense. Only time will tell.